Our purpose is to foster and support virtual Microsoft Access User Group chapters throughout the world, from beginning user groups to advanced topics such as SQL Server. Chapters can be organized around a language, such as Spanish, a region, such as Europe or a topic of interest, such as Access functions. Join a Microsoft Access User Group! Register for one (or more?) of our active and virtual Access User Groups, all with free membership! There’s a group for everyone, and they’re designed for both novice and expert developers. Find out more and register here. Here is our last video for the AUG SQL Server With Access chapter! To learn more click here to visit the chapter’s site. 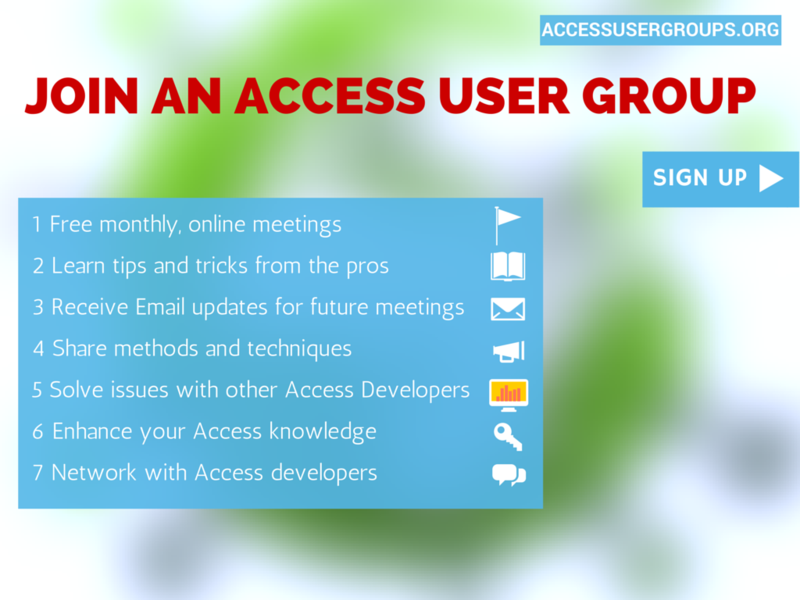 Help us spread the word about Access User Groups!